St. John Neumann was ordained in June 1836 at Old St. Patrick’s Cathedral in NYC. The Neumann Chapel, Buffalo NY. Just 16 days after his arrival in Manhattan, John was ordained a priest and sent to rural Buffalo. Father John established himself in a small log parish house. He hardly ever lit a fire and often lived on only bread and water. While in Williamsville New York, Father Neumann started the parish of Sts. Peter and Paul, which is in existence today (above). He also taught school four hours a day and used his knowledge of botany to make medicines from local herbs. Village of Williamsville NY (Buffalo) today, where John Neumann was a priest. He was assigned to the Buffalo, New York region which was a boomtown in the mid and late 1830s with commerce on the Erie Canal and stagecoach routes. Creek in Williamsville NY that John Neumann would have surely saw. The Sisters of Mercy were instrumental in working with Father Neumann while in the Williamsville New York region. Glenn Falls Creek today, by Michael Frank Jr.
Father Neumann made rounds to attend to the sacramental life of about 400 families. A journal entry shows John’s concern for the German immigrants: “They have not received any schooling. They speak German poorly, and English just as poorly. The will soon have to work, and there will be no thought of religious instruction.” This thinking was the start of the Catholic Parochial school system. 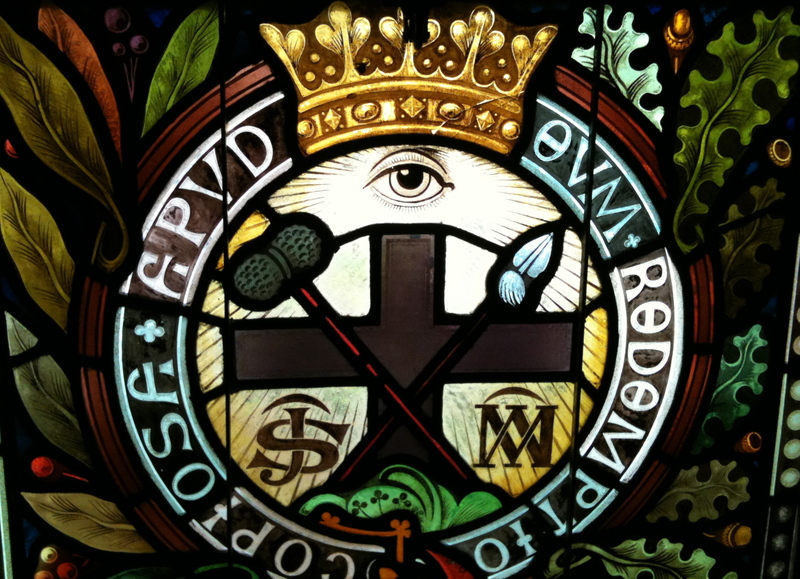 Redemptorist seal at The National Shrine of St. John Neumann, located at St. Peter the Apostle Church in Philadelphia, Pennsylvania. Father John joined the Redemptorist order and continued his missionary work until he was elected bishop of Philadelphia in 1852. Bishop Neumann was in attendance for Pope Pius IX’s proclamation of the Dogma of the Immaculate Conception. Bishop Neumann took up residence at St. John the Evangelist parish in downtown Philadelphia. Also in the 1850’s a young Katharine Drexel received First Holy Communion at St. Johns the Evangelist Church. She later became founder of the Congregation of the Sisters of the Blessed Sacrament, and a saint, St. Katharine Drexel! Parish of St. Peter the Apostle in Philadelphia. The upper church is where St. John worshiped in Philadelphia. Pulpit where St. John Neumann preached. Parish of St. Peter the Apostle in Philadelphia. Lower church is the National Shrine of Saint John Neumann. Under the altar are the remains of St. John Neumann in a glass reliquary. 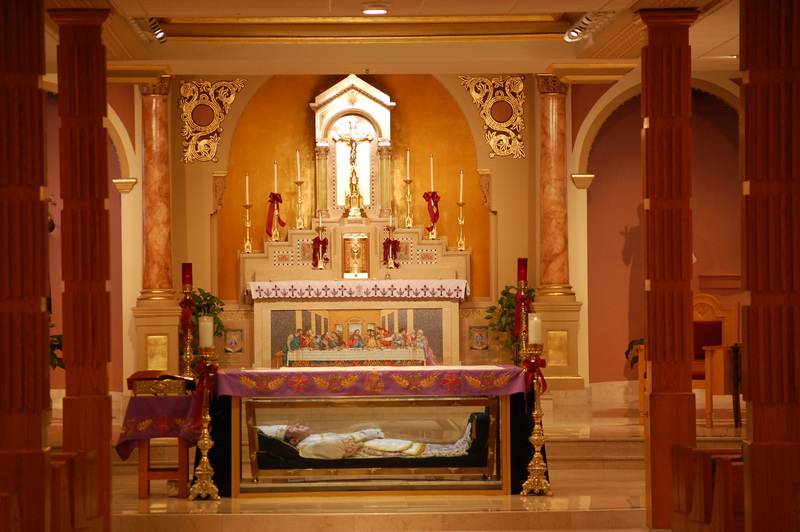 St. John Neumann body incorrupt, (face with mask). Bishop Neumann passed away in Philadelphia while doing errands on January 5, 1860. St. John collapsed and died due to a stroke, a few blocks from Logan Street, where he was building the Basilica of St. Peter and Paul, the regional Church that stands today. He is a patron of immigrants and of sick children. Memorial of St. John Neumann, Bishop is January 5. A man must always be ready, for death comes when and where God wills it. I went to Bishop Neumann HS in Williamsville, NY. I had no idea he was such a great man. Wow!